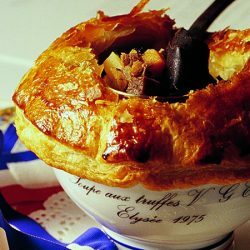 American chef François de Mélogue, founder of award-winning restaurant Pili Pili in his hometown of Chicago, is a strong advocate of regional French cuisines, specifically the rustic cuisines of Lyon and Provence. 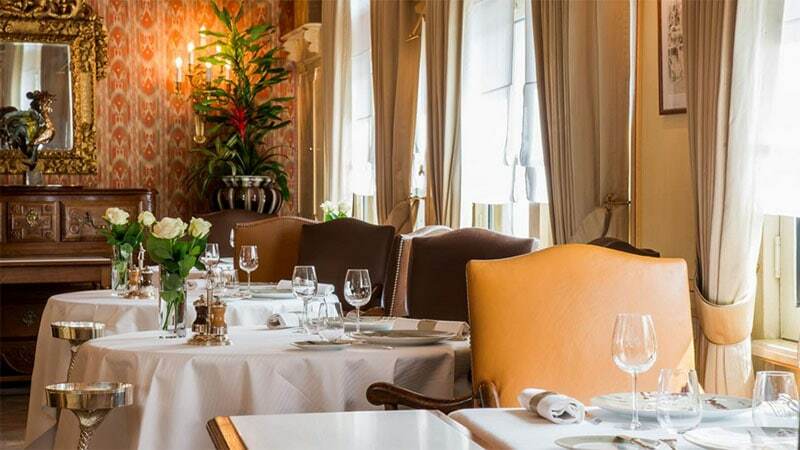 He tells us about his first experience at Paul Bocuse restaurant (part 3/3). Very refreshing palate cleanser that thankfully was not overly sweet, made from Beaujolais wine and cassis. This dish is why I came here and would have happily spent 275 euros on this course alone. Last year I went to the Escoffier Museum in Provence and saw one of only two knives Mére Fillioux used to cut chickens tableside in her dining room throughout her lengthy career. This dish encapsulates one of the most historic periods of change by being a bridge from the Escoffier era to when the Holy Trinity of Fernand Point, Andre Pic, and Alexandre Dumaine shunned the heaviness of classic French cuisine and started the modern farm to table movement by offering only what was regionally available on a Michelin starred level. 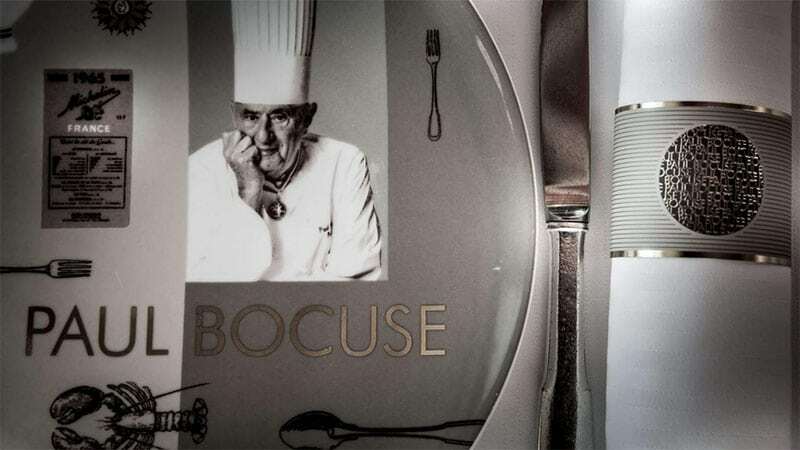 Point taught Bocuse to respect the integrity of the raw product. This dish was better than I ever have hoped for; the tableside carving was done on a level of perfection that one rarely sees, even by the world’s best chefs tucked away in their kitchens. The Bresse chicken steamed in a pig bladder was beyond moist and juicy. The morel sauce sang perfectly, complementing the meat; the only part lacking were the accompanying vegetables, they were good, but not really necessary. The 2014 Chateau de Marsannay, Marsannay Les Echezots went great with the bird. It had a beautiful barnyard flavor with ripe cherries. I had to laugh at one online review denouncing Paul Bocuse as being chauvinistic because women at the table got smaller portions. The waiters split one chicken for three of us at the table. I grant that my wife’s portion was smaller, but I think she was thankful of that. If she had said she wanted more, they would have gladly obliged. Here is where pretty much every great French restaurant separates itself from the rest of the world. To be offered great cheeses, in various states of ripeness, served at the correct temperature, is one of life’s greatest gifts. How do you choose which to eat? Simple, you try them all. I think I personally tried at least five different cheeses all served with a walnut bread. Jack poured a youthful 2015 Christophe Semaska Chateau de Montlys Côte Rotie full of earthy black fruit and lively tannins that worked incredibly well with the cheeses. We ended up eating every single dessert on the cart, the standouts were Île Flotante and Baba au Rhum, two classics done perfectly. By the way, when you order the baba, the waiter generously pours about ½ a cup of rum onto it before handing it to you. We drank a Domaine des Bernardins Muscat de Beaumes-de-Venise that paired well with the collection of desserts. I cannot forget to mention the wonderful mignardises and coffee that always come after a great meal. They provide a final moment to reflect on the meal just enjoyed before your royal carriage turns back into a pumpkin. 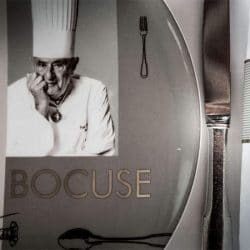 Next time you are in France, if you make it to Lyon you have no valid excuse, you need to make a special detour to Bocuse and enjoy a meal of a lifetime. Ignore the self-important social media reviewers who think they know what food is and do not understand the evolution of cuisine. Paul Bocuse is a legend and his food is still as relevant today as it was 60 years ago when he first created it.